The absolute easiest way to roast Leg of Lamb is this Slow Cooker Leg of Lamb recipe. 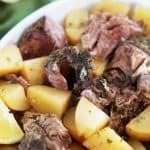 This Roast Lamb Leg with potatoes is tender and flavorful. It is the perfect Leg of Lamb recipe for special occasions like Easter but easy enough for a weeknight dinner as well! When I was in graduate school I worked at a Greek restaurant near Charleston, SC (Athens in James Island if you’re wandering!) and fell in love with their leg of lamb-it was always perfectly cooked with the most tender potatoes served along side. They were perfectly seasoned with oregano and lemon, my mouth waters just thinking about it! Since then I’ve been on a hunt to perfect my own version of that recipe (theirs was closely guarded!) and after over ten years I can tell you that this Slow Cooker Leg of Lamb Recipe is the closest I’ve gotten! 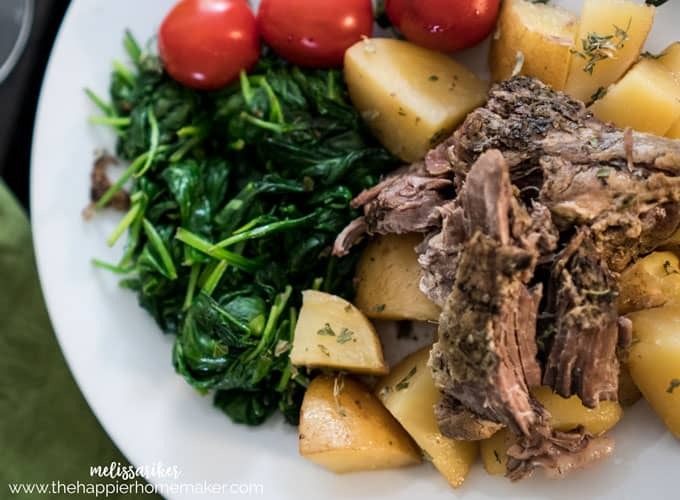 Making Crock Pot Leg of Lamb guarantees fall off the bone perfectly cooked lamb, plus it makes it easy which is always a bonus! Try this for your next dinner party and your guests will be raving! Heat oil over medium high heat in a large skillet and brown the lamb on all sides, about 3 minutes per side. Meanwhile add half of garlic and the potatoes to the bottom of the slow cooker. 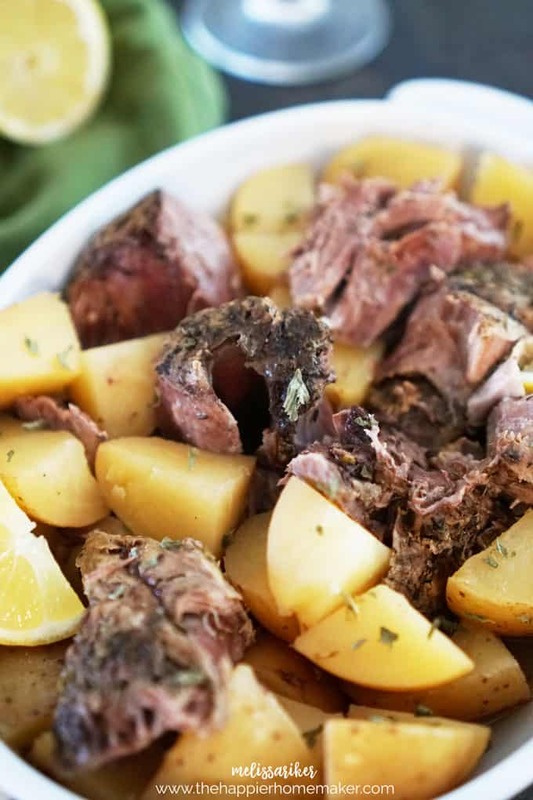 Place lamb over potatoes and sprinkle with oregano and place remaining garlic over top. Pour wine over potatoes. Cover and cook on low 6-8 hours or high 5-6 hours. Squeeze lemon over potatoes just before serving and season to taste with extra oregano if desired. 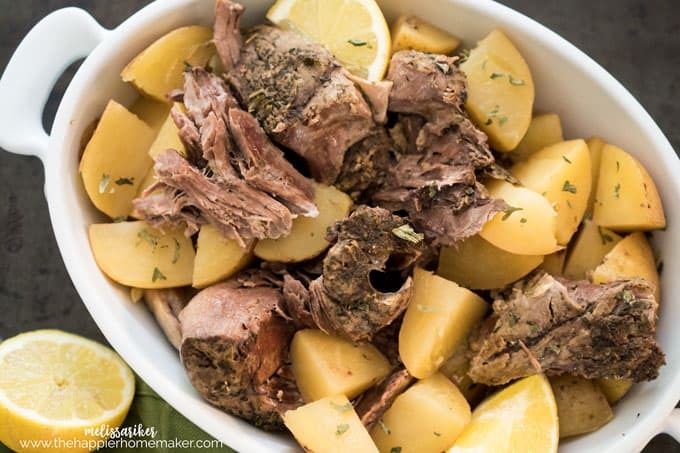 Easy Slow Cooker Greek Leg of Lamb in the Slow Cooker – fall off the bone tender lamb with perfectly roasted lemon potatoes all made in the crock pot! Turned out beautifully and the potatoes had a wonderful lamb flavor. Thank you! it’s about 4-6 servings depending on the size of your leg of lamb! This sounds fantastic! I have a boneless leg of lamb. Does this change anything in the recipe?